I have not decided what to use it for, it was offered and I just could not say no, would it be any good for cutting or sintering???. 3 watts sounds like a reasonable amount of power. 3 Watts is only enough for cutting thin sheets of absorbing material or engraving organic materials like colour on PCB's or such. * Fixed Tip Assembly - Never have to center the tip again. I have been selling a 1.7W 455nm Diode Laser head that works in conjunction with the 3D extruder with no need to swap out for laser cutting. We have a Makerbot 3D printer that we use for laser cutting solder stencils and other things. We have sold upgrade kits to people with RepRaps and Felix printers as well. Check out: www.laser-bot.com for more details. Or check out www.jtechphotonics.com to buy the kit. 1.7W laser kit with adjustable 2.0 amp driver is only $224.99. I'm thinking of adding an 808nm Laser module to an existing CNC router. I hope to be able to cut 3mm black abs/acrylic and also mark/engrave black or clear anodized aluminium. My machine has a maximum speed of 33mm/sec so wouldn't be doing anything too fast. What do you think of these kale units? Do you think a 10W unit would do the job? You probably should get CO2 at that price range. Right, but CO2 is going to be much harder to install on my existing machine, plus my machine is mobile! It is built in to a trailer, and as I understand it CO2 lasers do not like to be moved / or vibration? Edited 1 time(s). Last edit at 11/06/2014 07:18AM by VDX. So you can mark black anodized aluminium with 2W 445nm, Ok, well that's interesting. Do you have an examples of your work, what is the quality like? As for the 808nm 10W, do you mean it will be better than 975nm 9W, but not as good as 445nm? Have you tried clear anodized aluminium? Edited 1 time(s). Last edit at 11/06/2014 09:05AM by winchymatt. ... attached is an example engraved with 1.7Watts ... but this can be much more white with even lower power on other types of anodizing. "As for the 808nm 10W, do you mean it will be better than 975nm 9W, but not as good as 445nm?" So in conclusion, for the purpose of marking anodised aluminium would you say I would be better buying a 3W 445nm laser than a 10W 808nm? On a separate note, disregarding cutting speed, would a 3W 445nm or 10W 808nm cut 3mm ABS? Thanks for sharing your expertise! 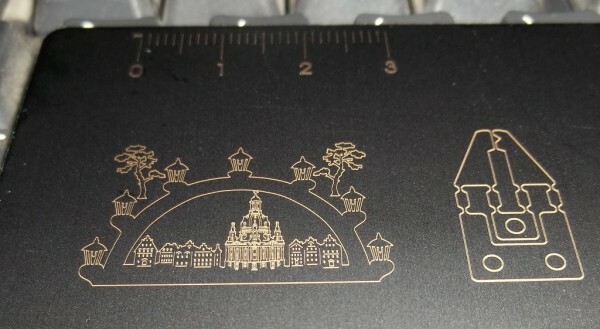 Your example engraving looks very good! Edited 1 time(s). Last edit at 11/06/2014 02:05PM by winchymatt. I just got an email from Kale CNC who make the lasers, they also suggested one of their 1.55W 445nm for anodized aluminium. This 2.8W kit looks pretty good! Although it does state that for prolonged periods of time the laser shouldn't be run at more than 2.2W. Yes, you can overpower them for a while ... but then you reduce the 'expected lifetime' from some 10000 hours (if cooled properly) to some 10 hours! My experience shows, that most marking and cutting jobs are better done with the 445nm-diodes, especially for their finer focus diameter (0.04mm compared to 0.1mm with the fibercoupled 9W-IR-diodes) and so higher energy density. The fiber coupling is intended for fibers of 0.4mm (with the red diode for 0.6mm), so it is less suitable for engraving than the 975nm diodes with fixed 0.1mm fiber.